Reader Steven Morrison worked hard to find an answer — but didn’t come up with a good explanation for a perplexing question: What in the world was meant by the use of the term “order books” for some early Virginia court records? It’s a good question, since that name for that type of record is pretty much confined to Virginia. Just about everywhere outside of Virginia, an order book is a type of court record where specific court orders are recorded: an order entering judgment, for example, or ordering a litigant to pay costs, or allowing someone to sell property while a probate case was pending. But in Virginia, order books do have a whole lot more — reporting all kinds of actions by the courts and their justices. And that’s the kind of information that, in most other jurisdictions, you’d expect to find in the minute books of the court. Which, just to make things really confusing, Virginia also has. So we really have two questions here, don’t we? 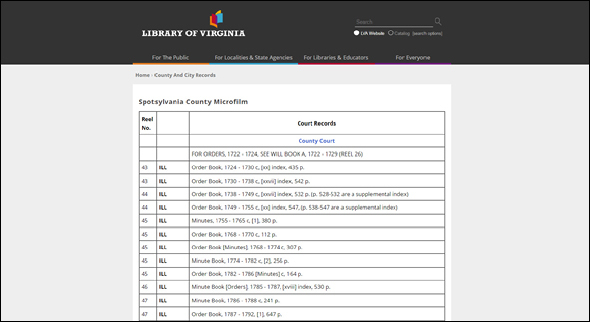 What’s an order book in Virginia and, The Legal Genealogist would add, why do early Virginia courts often have both minute books and order books — and what was the difference between them? The Library of Virginia (LVA) — Virginia’s State Archives and State Library combined under one roof (“the commonwealth’s library at the seat of government and the state archives”1) — doesn’t provide a whole lot of guidance on its website. Sounds reasonable — but are we right about that? So the minutes are an early rough draft and the order book the final version. And that’s pretty much the same as the minutes-to-order books process later: the clerk drew up the first set on the scene and then made a better, more complete record when he had time. It was that later set that the court accepted as its official record. But it sure does mean a researcher should look at any and every surviving record set for those early Virginia courts — understanding what the difference is likely to be, between minutes and order books, at that time and place. Double down in those records, if you can — look at both minutes and orders books in Virginia, or whatever survives of either. Cite/link to this post: Judy G. Russell, “Order in Virginia courts,” The Legal Genealogist (https://www.legalgenealogist.com/blog : posted 2 Apr 2019).